Colorado Springs, Colo. : David C. Cook, c2010. 750 p. : chiefly col. ill. ; 27 cm. 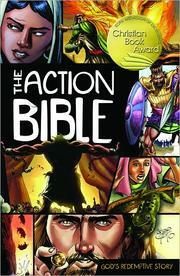 The action Bible : God&apos;s redemptive story / illustrations by Sergio Cariello ; general editor, Doug Mauss. 100 Personl Name ME 1 $a Personal name Cariello, Sergio. $c Statement of responsibility illustrations by Sergio Cariello ; general editor, Doug Mauss. 505 ContentsNote 2 $a Formatted contents note Old Testament. Creation ; Fathers of the faith ; The life of Joseph ; Moses ; Joshua ; God&apos;s judges ; The kings ; The prophets ; The exiles -- New Testament. Jesus&apos; birth and ministry ; Jesus&apos; final days ; The church is born ; Paul. 520 Summary Etc. $a Summary, etc. note Retells the stories of the Bible in graphic novel format, including the stories of Noah, Abraham, Jacob, Joseph, Moses, Jonah, and the life and death of Jesus Christ. 650 Subj:Topic $a Source other than LC Graphic novel. 655 7 $a Graphic novels. 700 AE:PersName 1 $a Name Mauss, Doug.